The Post Star reports that Walter Grishkot has recently passed away at age 85. Grishkot was the founder of the Adirondack Balloon Festival, a popular local event that draws a crowd of around 50,000 people every year in Queensbury, NY. In remembering Walter Grishkot, we want to celebrate his role as Adirondack Balloon Festival Founder and for being an uplifting community spirit. A photographer by profession, Grishkot set up a scene to shoot in 1972 that would quickly make national news: A hot air balloon hovering over an outhouse with a ladder descended! According to the Adironadack Almanack, the caption read: "An unscheduled stop to the Adirondack Balloon Festival." Grishkot released the photo to the press, and soon the "Adironack Balloon Festival" was making news all over the country. That first year, just over a dozen balloons showed up for launch at the Adirondack Community College, and a timeless event was born. 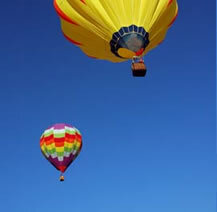 Today, the Adirondack Balloon Festival has grown to include hundreds of balloons and is held at the Floyd Bennett Memorial Airport in Queensbury, NY. For over 30 years, the Adirondack Balloon Festival has been a free, family-friendly event, drawing spectators and balloonists from all over the globe.